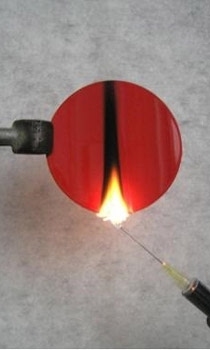 The needle-flame test is used for the assessment of fire hazard caused by small flames, which may result by ignition of a failing component of electric equipment. The test specimen is arranged in a vertical position. A wrapping tissue on a pinewood board is placed below the sample. The specimen is subjected to a 12 mm flame (Propane, at least 95% pure). The application time of the flame to the specimen can be 5 s, 10 s, 20 s, 30 s, 60 s or 120 s depending on the specific end product specification. b.) flames or glowing of the specimen and the layer below extinguish between 30 s after removal of the flame.